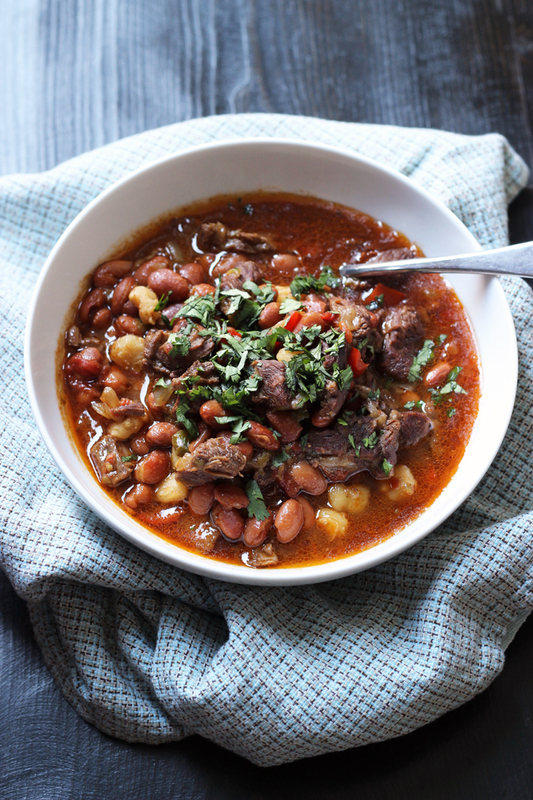 Come home to the amazing aroma of this Spicy Beef & Bean Stew that cooked in the slow cooker while you did other things. It’s hot and spicy and utterly delicious! I’m rather particular about what I put in my slow cooker. As a general rule, I don’t do those dump meals because the texture of vegetables that have cooked all day long is usually something less than desirable. Instead, I focus on recipes that are meant to be braised, simmered for a long time. 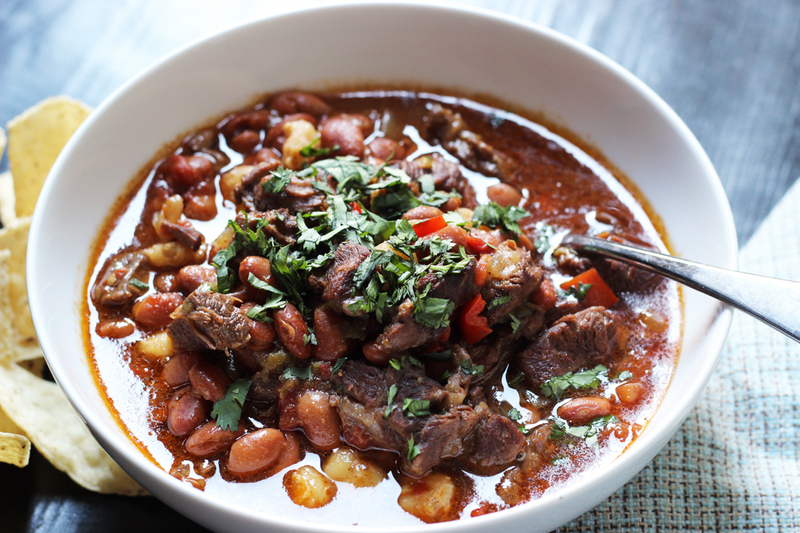 This Spicy Beef & Bean Stew Recipe is it. 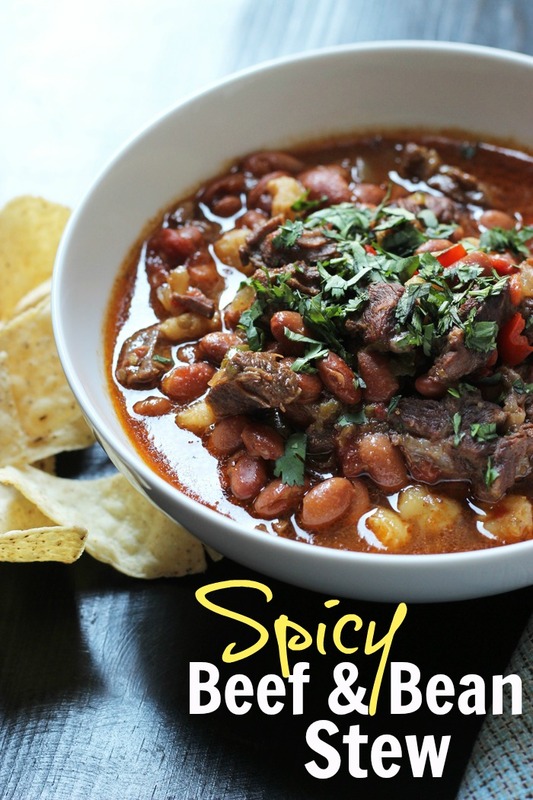 Not only does it pack a bit of heat from diced jalapenos, but it’s also full of hearty chunks of beef, luscious flavorful broth, and hearty beans and hominy. It’s the perfect slow cooker recipe where you can set it and forget it. If you prefer to lower the heat, feel free to use chopped green chiles instead of jalapenos, but know that this bean stew is flavorful and delicious. It’s perfect no matter the weather since there’s such minimal prep time. I took less than 30 minutes to chop the meat and vegetables, sear the beef, saute the veggies, and throw it all in the slow cooker. Then I just walked away. For hours. What a treat to go about my business, knowing that I didn’t have to cook dinner — because I already had! For better or worse, my family really does not care for canned soups and chilis. I’ve made homemade for so long, their taste buds just don’t jive with the commercial variety. And quite honestly, I agree. Homemade is always better! 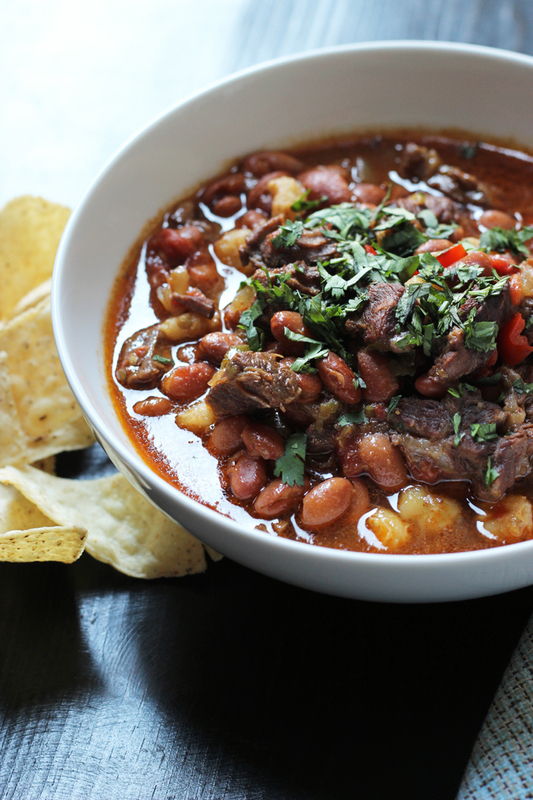 This Spicy Beef & Bean Stew is packed with flavor and fiber, hearty chunks of beef, and a handful of veggies to round things out. I buy the meat when it’s on sale. In fact I stock up and buy several packages at a time so I always have some in my freezer. Hint: watch your grocery sales as beef chuck roasts and steaks often go on sale this time of year. If you can’t find chuck roast for a reasonable price, you can substitute pork shoulder or even browned ground beef or turkey. This bean stew recipe is very forgiving. You can even use half the meat or add more beans in order to stretch your protein purchase. Cooking dry beans, instead of buying the can, is often more economical. I bounce back and forth between the two, depending on how much time I have. Whenever I can, I’ll cook a few pounds at a time in the slow cooker and freeze them for later. Watch the clearance racks for canned goods that are marked down. Canned jalapenos and chiles are often some of my finds here. If I don’t buy them at a good price, I substitute fresh chopped chiles instead. 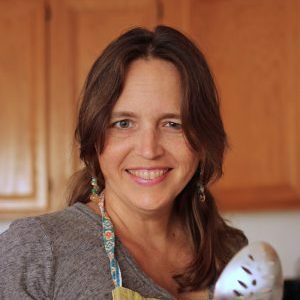 my favorite skillet – it’s oven safe and has a glass lid. I bought two I love it so much. fine mesh sieve – Perfect for rinsing beans. I bought this set in April and love the different sizes. 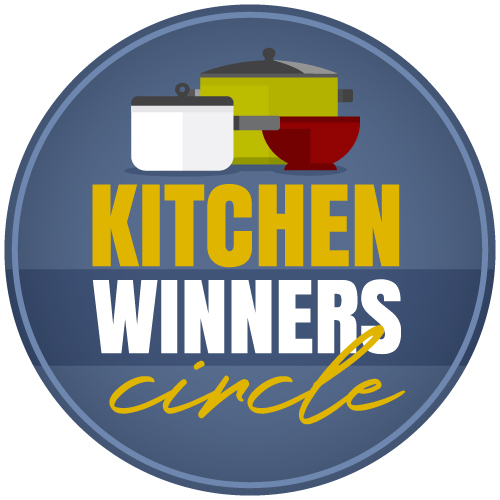 6-quart slow cooker – I’ve had this machine for several years and have been really pleased with it. In a large nonstick skillet over high heat, heat the oil. Season the beef cubes with salt and pepper to taste. Brown the cubes, in batches in the hot oil, until browned on all sides. 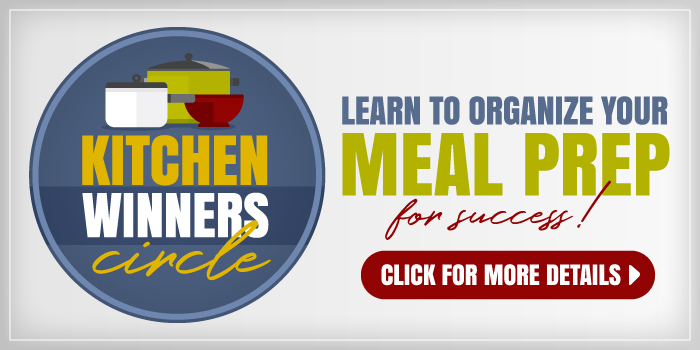 Place the browned meat in the crock of a 6-quart slow cooker. Add the chopped onion to the drippings in the skillet and cook for three minutes on high heat, stirring. Add the chopped bell pepper and cook another two minutes, until the vegetables are tender and onion is translucent. Transfer the vegetables to the crock. Add the beans, broth, hominy, tomatoes, jalapenos, chili powder, oregano, cumin, and coriander to the crock. Stir gently to combine. Cover and cook for 6 hours on HIGH or 8 to 10 hours on LOW. Serve hot. If you’d like to freeze the stew, chill it completely in the refrigerator before storing it in the freezer in airtight containers. Thaw and reheat as you would any soup or stew: in the microwave or in a pan on the stove top. This looks absolutely delicious!! I am so longing for hot hearty foods like this but with the miserable hot humid weather we are experiencing right now, it’s hard to eat anything except salads and ice cream!!! LOL I am looking forward to some cooler weather in the next month or so and then I’m going to do the changeover from burgers and everything grilled to soups and stews like this one. Can’t wait!! Has it cooled down yet there? This looks delicious! We’ll definitely try this once the weather cools back down. I love soups/stews during the school year when our schedules are so hectic. If I”m using dried beans, could I pre-soak them overnight, then just throw them in with everything to cook, or do I need to go to the step of cooking them first? You may want to start the beans a few hours in advance and then added the browned meat and veggies. Just to be sure the beans cook through. Sometimes they can take 8 to 10 hours to soften well. I quicksoaked 2 cups dry pinto beans in dutch oven, didnt cook them through – just added an extra 1/2 cup water to the crockpot. The beans were perfectly soft and the stew was delish! A deep rich flavour. This looks SO yum! I’m going to try a vegetarian version of this on the weekend. Thank you. Do you think the leftovers from this would freeze well? Yes. I’ve got a batch in the freezer right now. I even halved the recipe and made a second one with no beans for my husband and it was just as good! I seriously can’t wait to take the leftovers for lunch tomorrow! 🙂 thank you for sharing!!!!!! Was absolutely yummy. Made it with a tin of sweet corn and kidney beans as I am not sure where to get pinto or homily and slow cooked in the oven for 4 hours! Thank you! ?? Great substitutions! So glad you enjoyed it!